At WooCart we’re building a hosted WooCommerce platform to make it super easy to set up, host and manage stores. Most importantly without Shopify’s big disadvantages where you don’t own your store and pay a sales fee. In this context, it was important to test everything so we decided to do our own dropshipping store, Roses ‘N’ Tech. I’m a marketer with experience in software, financial markets, and eCommerce. Two years ago I was running my own dropshipping stores on Shopify but gradually switched my focus to other things that were more important to me. But here I am again playing the game! 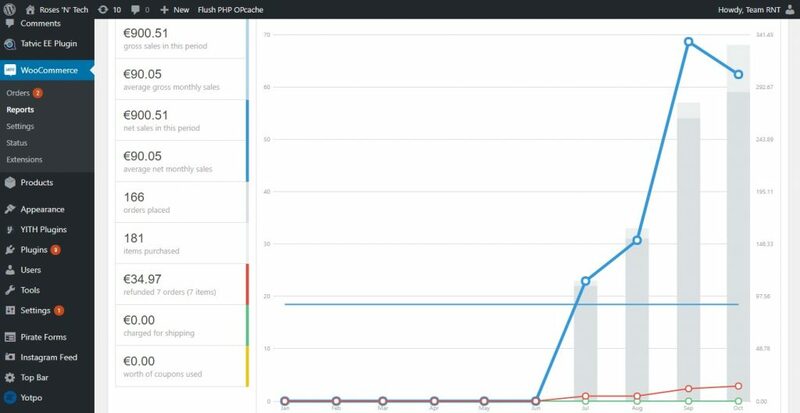 To properly test WooCart, the dev team needed traffic and a couple of orders each day for a couple of months. I had to do that without putting too much time into it because my main responsibility was actually marketing WooCart. In the next few paragraphs, I’ll only talk about the marketing part, the setup of the store was already covered by my colleague Dejan in The suffering I had to go through to set up a basic WooCommerce store. 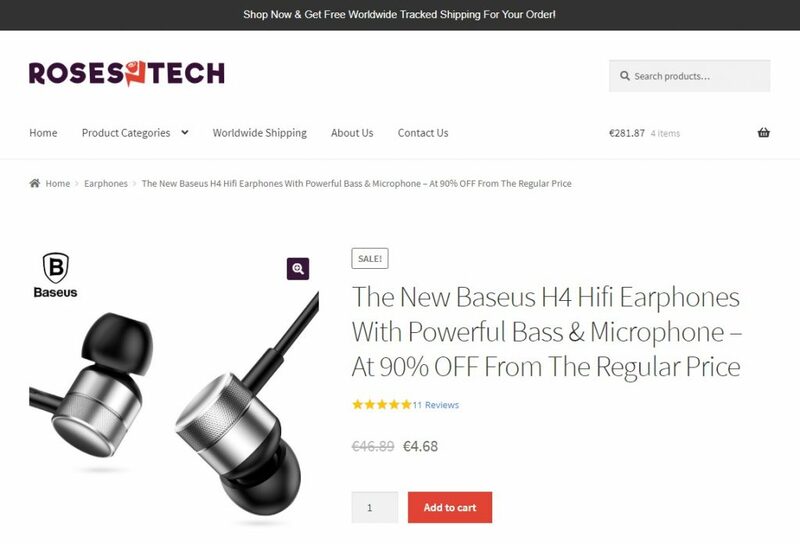 Roses ‘N’ Tech store sales and ads are focused on a “star product”. This is where you can easily go wrong. For me, it was a shoot and score from the start because I already have experience in knowing what works and what doesn’t. AliExpress is a huge marketplace but by following my tips I’m confident you will eventually find your winner as well. You should pick a product with a big difference between the perceived value and the actual cost. The rest of the products are just for credibility and for better positioning the star product. You can have more expensive products so that the discounted price of the star makes sense. And you don’t need a lot of products, just a couple to have a full home page. I definitely advise you to have a limited discount on the star product. That’s because you want to create a sense of urgency. You are not a big retailer where people come over and over again. You only have one shot to get it right. To push even further with the urgency, you can add a top bar with the CTA “Shop Now & Get Free Worldwide Tracked Shipping For Your Order!”. Social proof is huge and that’s why I also added a sales pop plugin. This shows the previous sales on the website and basically says to your visitors that your store is busy, credible and trusted by others. Not to mention that by seeing the ongoing sales, the first thought is that the star product might go out of stock. Finally, keep it simple and straight to the point with everything that you do. More complex things translate into a cognitive overload that sinks your sales. And if something doesn’t work is much harder to find and fix the issue. By advertising a single product on Facebook I managed to get between 2 and 6 orders per day constantly for 4 months. But there were many long periods when I stopped advertising because our developers had to do different changes on WooCart. Nevertheless, that’s a lot when you also take into consideration that I mostly ran one ad with different price variations. What you’re seeing here should be normally considered just the entry point in a funnel. What’s encouraging is that you can sustain a constant growth, both in orders and in the number of items per order. The revenue isn’t spectacular because the product is really cheap, but our end goal was never that. If this is your goal to have a successful dropshipping store then you definitely need to up-sell and cross-sell, create a newsletter, and A/B test a lot. You should also try selling through Instagram influencers who are pushing sales in many different niches. Scaling the Facebook ads is a problem that many marketers have because they start with a too narrow targeting. You need to go big if you want a chance at having the Facebook conversion algorithm work for you. The hot spot for that is at around 50 conversions per week. This doesn’t mean it’s 50 or nothing but you must go as far as you feel comfortable with your targeting. And when you want more conversions you just increase your budget, no need to start looking into different scaling strategies. In the first one, I add all the things that I can think of. These are bridges between the product and the buyer. In this case, I went with audio equipment brands, music genres that have a lot of bass (the name of the product is Baseus), famous people who resemble the person in the product image, even added the band Guns N’ Roses (the store name is Roses ‘N’ Tech), and many more. The second layer is based on the main feature of the product but you must be creative with it in order to find a relevant Facebook interest. I went with the hip-hop music genre. Finally, I added a layer based on the shopping behavior, to make sure these are actually people who buy things and ended with a huge audience of 42 million. 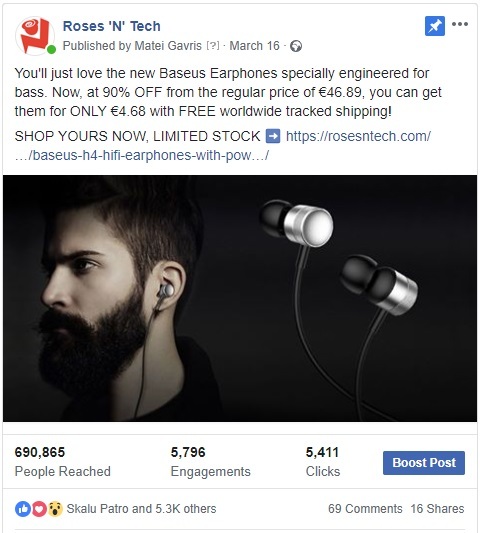 With an audience like this, the conversions can only get better and better as Facebook is learning what works and what doesn’t. Setting your budget is just simple mathematics. How many orders do you want per day and how much are you willing to pay for that? We wanted just a couple and the product is really cheap so I set the daily budget at $15. For expensive products, you can easily go 10x on it. In a way, dropshipping is dead, at least with the methods from years ago. Now, I’d say you don’t have a chance at dropshipping success without good marketing skills and without putting time and effort into it. Realistically, even if you do everything right, with really cheap products you shouldn’t expect a larger profit than $1k per month. If you go higher towards $100 product price you can probably make a couple more. But take into consideration that selling more expensive products and maintaining a constant flow will be a lot harder. Either way, dropshipping is really good to sharpen your marketing skills, to stay connected with the market and to eventually find your next great opportunity. So what kind of opportunities should you look for? See what sells and create your own brand. Control the price. Control the quality of the products and of the shipping (even if it’s still dropshipping). Go to China and meet the manufacturer. You’ll need money, of course, but we aren’t talking about a fortune, if you’re resourceful you should be able to launch your own product in almost any niche you’d like. If you liked this article and you’are interested in trying WooCart when we publicly launch, we can stay in touch by signing up now for our Newsletter!